Laplace is a word often encountered in Physics and Mathematics but who exactly was this pioneer of many theories? 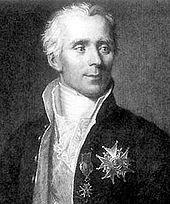 Pierre-Simon Laplace was an eminent French mathematician, astronomer, and physicist of the 19th century. He was famous for his remarkable contributions in the field of celestial mechanics, probability and statistics. He also formulated Laplace’s equation and pioneered Laplace transform. He was one of the first scientists to postulate the existence of black holes and the notion of gravitational collapse. Laplace was born on March 23, 1749 in Beaumont-en-Ange (Normandy), France. Until the age of 16, he studied in a secondary school of Beaumont-en-Ange. In 1766, he went to the University of Caen to study theology. There he was taught mathematics by two famous mathematicians, Pierre Le Canu and Christophe Gadbled, who awoke his zeal for the subject. In 1968, he left for Paris with a letter of recommendation from Le Canu to Jean le Rond d’Alembert, to pursue mathematics further. The famous French physicist, d’Alembert, gave Laplace a problem to solve in a week but he solved it overnight. d’Alembert was impressed and recommended him for a teaching place at École Militaire. At the age of 20, Laplace became a professor of mathematics and taught geometry, trigonometry, and statistics. In 1773, he was elected to the Acad´emie des Sciences de Paris (Academy of Science) and in 1780’s he was one of its leading members. His diverse collection of work began in mathematics. His early published work was related to difference equations and finite differences. While working on recurro-recurrent series, he encountered probability. Laplace broadened the concept of probability and included all ranges from hypothetical containers, philosophic causality, and scientific error to credibility of evidence. Then he started working on celestial mechanics and the stability of solar system. In 1776, he published his work on the stability of solar system. In his paper he tackled a problem from observational astronomy related to apparent instability by which Jupiter’s orbit appeared to be shrinking while that of Saturn was expanding. Euler in 1748 and Lagrange in 1763 tried to solve this problem but without any success. Laplace concluded in his paper that any two planets and the sun must be in mutual equilibrium and according to Gerald James Whitrow, this was the most important advance in physical astronomy since Newton. He also restated and developed the nebular hypothesis of the origin of the solar system, first stated by Emanuel Swedenborg. According to Laplace’s description of the hypothesis, the solar system had evolved from a globular mass of incandescent gas rotating around an axis through its center of mass. As it cooled, this mass contracted, and successive rings broke off from its outer edge. These rings in their turn cooled, and finally condensed into the planets, while the sun represented the central core that was still left. On this view, Laplace predicted that the more distant planets would be older than those nearer the sun. In his famous book Méchanique Celeste, he gave analytical description of the solar system. In 1799, the first two volumes of this book were published. They contain methods for calculating the motions of the planets, determining their figures, and resolving tidal problems. The third and fourth volumes, published in 1802 and 1805, contain applications of these methods, and several astronomical tables. The fifth volume was published in 1825 and it contains result of Laplace’s latest research. In 1812, the first part of Théorie Analytique des Probabilités, a book of mathematical probability theory, was published and in 1814 and 1820, the second and third part was published respectively. These books summarized Laplace’s work in probability and statistics since 1774. Because of his mathematical abilities and contributions, Simon Poisson called him the Isaac Newton of France. Laplace’s work on error theory, central limit theorem, and integral calculus is also well-known. In 1810, he corrected the value of speed of sound, calculated by Newton. He points out that speed of sound in air depends on the heat capacity ratio. Newton’s original theory gave incorrect value, because he didn’t consider the adiabatic compression of the air that results in a local rise in temperature and pressure. Laplace also worked with Lavoisier to calculate specific heat of various bodies. His career successfully spanned three regimes in France- the republic, the empire of Napoleon and the Bourbon restoration. After revolution, he worked in the Commission of Weights and Measures to establish metric system. In 1799, he served as Napoleon’s Minister of Interior for short interval of six weeks. Napoleon made him a count and Louis XVIII made him a marquis. Previous article20 Astonishing Facts About your Body!